Inhabited since the late 17th century and incorporated in the early 1800s, Summerville has managed to maintain its identity as a small town with big ideas. Summerville prospered when, late in the 19th century, the International Congress of Physicians declared the town one of the two best places in the world for people suffering from lung disorders, apparently a result of the healing aroma of its ubiquitous pine trees. Today, though it is the seventh largest municipality in South Carolina, Summerville still basks in its small-town atmosphere, even during the annual three-day Flowertown Festival, when more than a quarter-of-a-million people visit to check out the artists, crafters and vendors and pay homage to the azalea. Just a few miles northwest of Summerville's quaint downtown area, Lennar Corp. is building Wentworth Hall, a new community located off Old Orangeburg Road that when complete will feature approximately 280 homes. 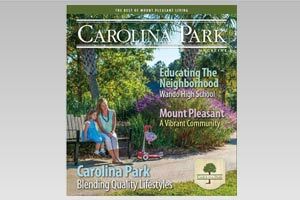 Wentworth Hall residents can enjoy the advantages of living near shopping, restaurants and some of the best schools in the state of South Carolina. And Charleston, a coastal city with a deep history that includes being a focal point of two wars, is just a short drive down nearby Interstate 26. "Dorchester Two is one of the most desirable school districts, and that's a primary motivator for families with children," said Shannon Williams, director of strategic marketing for Lennar's Coastal Carolina Division. DuBose Middle School and William Reeves Elementary School are only a half-mile from Wentworth Hall. For those who prefer the private school route, Pinewood Preparatory School is nearby, as are shopping, restaurants, a grocery store and Pine Forest Country Club. Lennar is currently building the first phase of Wentworth Hall, which will include 120 of the planned 280 single-family homes. A proposed swimming pool and cabana, wide sidewalks, green space and ponds will enhance the neighborhood's family-friendly atmosphere. Buyers can choose from a collection of 10 home designs that range from 2,088 to 3,566 square feet. Open concept floor plans offer three to five bedrooms and from two-and-a-half to three-and-a-half bathrooms. Among the choices is The Greenhill, a four-bedroom, three-and-a-half bath home that earned a Prism Award from the Charleston Trident Home Builders Association in 2008. Williams pointed out that when potential buyers visit a Lennar home, at Wentworth Hall and elsewhere, all the upgrades and extras they see are part of the purchase price. "It's our everything's included plan," she commented. "The hardwood floors, stainless steel appliances, Corian countertops and crown molding are included in the base price. That's a huge advantage to buying a Lennar home." She added that homes in Wentworth Hall are priced from the $190s and that Lennar is offering qualified home-buyers 100-percent financing through the U.S. Department of Agriculture. Founded in 1954, Lennar is headquartered in Miami, Fla. The company builds homes in 17 states in communities that cater to a wide range of lifestyles, including urban, golf course, active adult and suburban. 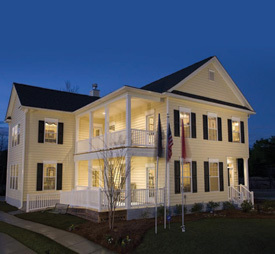 In addition to Wentworth Hall, Lennar builds homes in the Lowcountry at Cottonhope at Foxbank Plantation and The Boulevard at Foxbank Plantation in Moncks Corner; Hunters Bend in Summerville; and St. Charles Place in Goose Creek.